To have a friend, yes, even an online friend who pours her overflow of God’s blessings into your life is exactly the kind of friend I have in Lara. What’s more special to me is that she did so even before she knew I existed. Now, I’ve had tne honor to call Lara ‘friend’ for a couple of years and serve with her on the Hello Mornings Team. Yet, I didn’ know the depth of her walk through such a devasting valley. I knew however, that she does trust God. Her new book, To Walk or Stay, Trusting God through Shattered Hopes and Suffocating Fears reminds me that each of us has something that we are being challenged by that few, if any know about. What Hope of yours has been shattered? What Fears have suffocated you? No matter the circumstance, we all can use a reminder to Trust God through it all & that He Keeps His Promises.You will find such Hope in this book, told against the backdrop of her valley in simple, honest voice. And, Lara has also already prayed for you. I too pray that you will be enCouraged by Lara’s book through which she pours an abundant overflow of blessings that spring from the depths of God’s Love. A Love that she dared to Believe in. We all have to make a daily choice. Will we Walk or Stay. 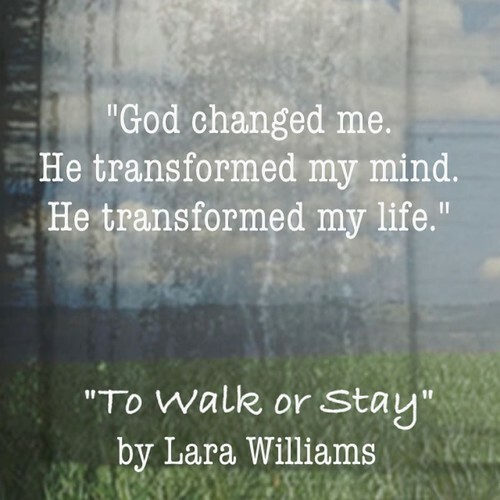 Be sure to pick up your copy of this New Book: To Walk or Stay. Trusting God through Shattered Hopes and Suffocating Fears. Please come back and let me know how Lara’s book has blessed you! This entry was posted in Book Review, Christian LIving, Encouragement, Faith, Family, Husband, Lessons, Marriage, Pain, Suffering, Testimony, Trust, Uncategorized, Wife and tagged Believe, Faith, Fear, God, HOPE, Marriage, Suffering, Trust. Bookmark the permalink. Such a great review for a great book. God’s word, Lara’s & Adam’s testimonies bless me so much. I highly recommend this book, too 🙂 Thanks for sharing it, Susie! What a great review! ;) I receive Lara’s posts in my email and cannot wait to get my hands on this book! It’s a wonderful book. I highly recommend it as well!